Elbow Kit for use with Fisher & Paykel Forma, FlexiFit™ 431 & 432 full face CPAP mask. 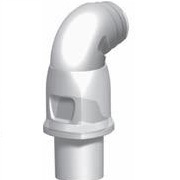 This replacement mask part connects the CPAP mask to the tubing through a swivel elbow. Includes one replacement elbow.